Small Sources No. 44. This is a list of 69 tenants on the Cloncurry estate in the Civil Parish of Abington (Barony of Owneybeg) directly east of the City of Limerick. 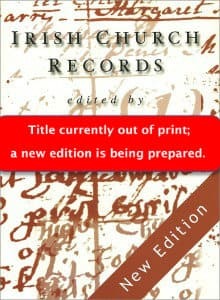 The original document is a rental in the National Library of Ireland (NLI Ms. 8183). See our article here for a detailed account of rentals and their relevance. The tenants are a mix of large and small tenants who together paid a total of £5,193 in rent, but the individual holdings range in rental amounts from £1.15 shillings to £965. The size of holdings is not provided. The record does provide the rent due and paid and any arrears. The notes in brackets provide some additional information on local townland names. The Abington estate comprised 1,796 acres and belonged to Lord Cloncurry, whose main estates and residence was in County Kildare. Further information on his Limerick estate is available here. 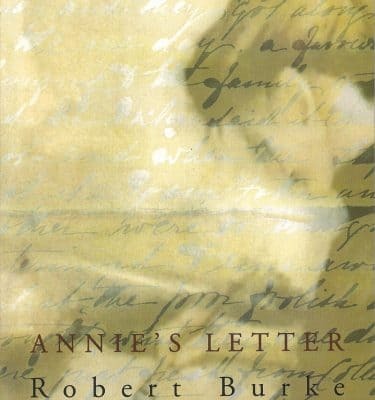 He was a controversial figure in the Ireland of his time. He was associated with the rebel group, the United Irishmen, and was imprisoned on suspicion of treason in 1798. However, he gained greater prominence after suing a friend for having an affair with his wife. The court case proved one of the great scandals of the time. A detailed account of the life of Lord Cloncurry and his attempts to introduce reforms to his Abington and other estates is in a Maynooth University PhD thesis available here. This is of particular interest because it describes his efforts to ‘improve’ his estates, i.e. to provide assistance to his tenants by developing their farms and the local infrastructure. As an ‘improving’ landlord, he gradually eliminated the ‘middle men’ on his estates. These were large tenants who did not themselves till the land, but rented it in smaller lots to sub-tenants. They often charged very high rents and provided no support to their tenants. Cloncurry got rid of these middle-men (where he legally could) so that he could deal directly with those tenants who worked the land. It is interesting to note, for instance that in 1818 there are only 4 tenants in the townland of Mongfune below, whereas in the Griffith Valuation (1851) he has 24 tenants in this townland. Only one of the 1818 tenants, Matthew Duhy, is still present and he is himself a large farmer. 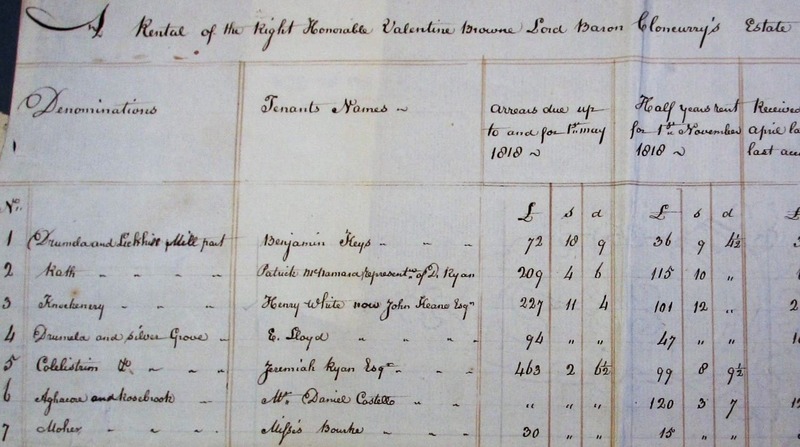 Henry White, a tenant in Knockanerry, seems also to be a middle-man and appears in the Valuation Books of 1850 as a holder of 31 properties in this townland. Some other points of interest among those listed include the use of nicknames. As identical names were very common, individuals would be locally distinguished by nickames, which often found their way into records. Two examples occur: we have Patrick Hayes – big, and Patrick Hayes 2nd. The reason for Patrick Hayes big is presumably his physical size, but why the other Patrick has been named ‘second’ is lost in the banter of time. 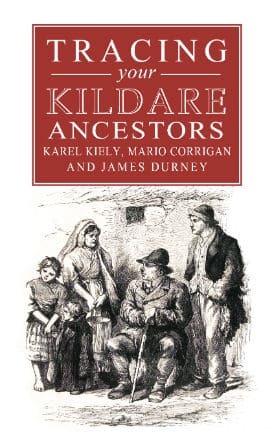 The other example, from a less politically-correct era, is Denis O’Brien ‘Hill’, and Denis O’Brien ‘Lame’. The names Hayes, Ryan and O’Brien are all relatively common names in this area. The name Humphrys, spelt in this way (rather than the more common Humphreys) is also mainly found in this part of East Limerick. Some family history of one of these Humphrys families is here. Ancestor Network will offer 1 free hour of research by a professional researcher to conduct further research on these individuals, or on other tenants of this estate. We can also obtain images of the original documents. Click here and quote ‘Limerick SS43’ in the subject line. 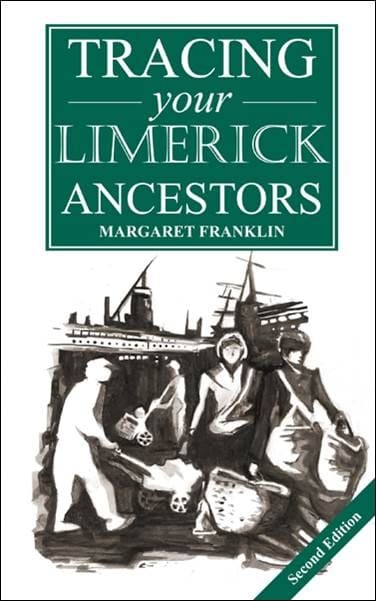 We also publish ‘A Guide to Tracing your Limerick Ancestors‘ by local historian Margaret Franklin.